As you can see from the screenshot the system runs fine with a total hashrate of about 190 MHS mining Quark (98 MHS total on X11 and 25MHS total on Lyra2RE) on all eight GeForce GTX TITAN X GPUs. 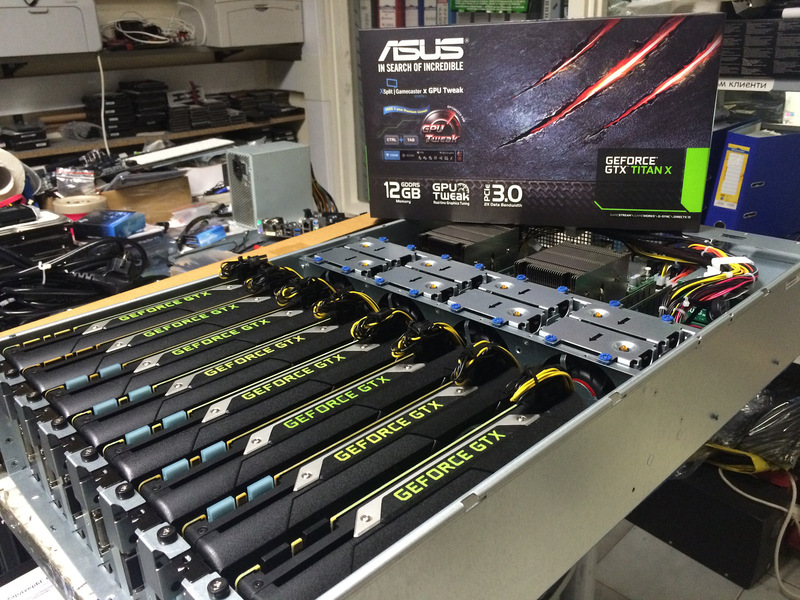 This means that a single TITAN X card gets you about 24 MHS for mining Quark-based crypto currencies and ll of the cards manage to provide optimum performance. 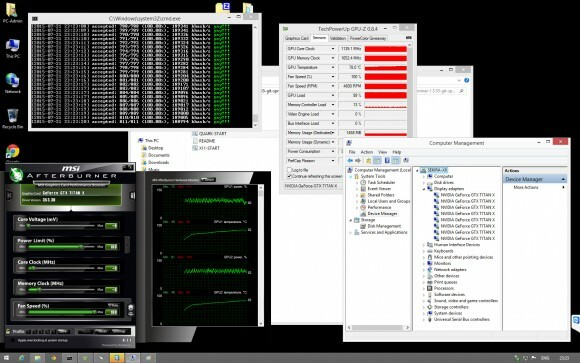 Notice that the fans are turned all the way to 100% for best performance, because otherwise the cards are easily hitting the thermal limit with their fans running on auto at about 50-60% and as a result they throttle down and you loose performance with the GPU frequency dropping down to 1000 MHz. Again this is not a system designed for crypto currency mining, but for compute applications, we were just curious how well it will perform for crypto mining and it does a great job with some tweaking. Of course since the whole thing is designed to be in a server room the noise level is not relevant, though it is quite high as expected thanks to the 8 GPU fans and the other 8 chassis cooling fans that are 24W each when running at maximum RPM. Maybe if GPU mining picks up to a large scale level like it is happening with Bitcoin mining and is profitable enough we might be able to see solutions like these used, but for now these are limited to businesses using them for high-performance CUDA applications. Think along the lines of 3D design, visual effects rendering, medical imaging, energy exploration or scientific simulations etc.